Wendy Nevala and David Asp, Ed.D., only met one time, but the meeting was enough to inspire Nevala to tackle the challenge of an Ironman one more time in honor of Dr. Asp. Wendy and Dr. Asp met just once, at a meeting of the Melanoma Education and Support Group, which he was instrumental in creating. Wendy, a principal research technologist in the Melanoma Research Program at Mayo Clinic's Rochester campus, was deeply moved by the opportunity to connect with some of the patients whose lives she is trying to save through her work. 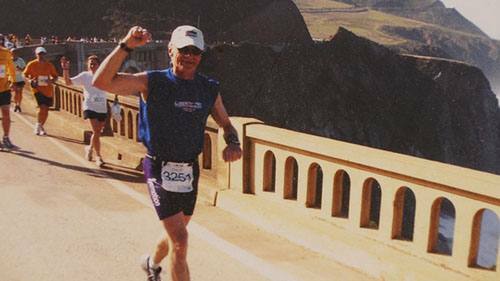 Dr. Asp made an especially strong impression, perhaps because of the shared connection that came from being part of the Ironman community. "It's a small brotherhood," Wendy tells us of those who tackle the challenge, which includes a 2.4 mile swim, 112 mile bike ride and 26.2 mile run. She and Dr. Asp had both completed three of the grueling competitions, which Wendy thought were firmly in her past. "As I got older and started feeling some aches and pains, I thought the Ironman training would be too much," Wendy, now 50, tells us. Meeting Dr. Asp changed that. "Dr. Asp had done Kona when he was 61, and he thought maybe he had one more marathon in him," Wendy says. Sadly, he passed away without getting that chance. Just before he died, Dr. Asp published a memoir, Start Line and Beyond: Chronicles of an Athlete/Cancer Patient. Wendy was among the first to read it, and says the book "reawakened" her desire to compete. "Dr. Asp was able to capture a lot of the reasons people undertake these endurance events," she says. "He was able to capture so eloquently the decision to do something that seems impossible and beyond what you think you can do, with no guarantee of the outcome. And he had the same attitude about facing cancer: Keep moving forward and never give up." 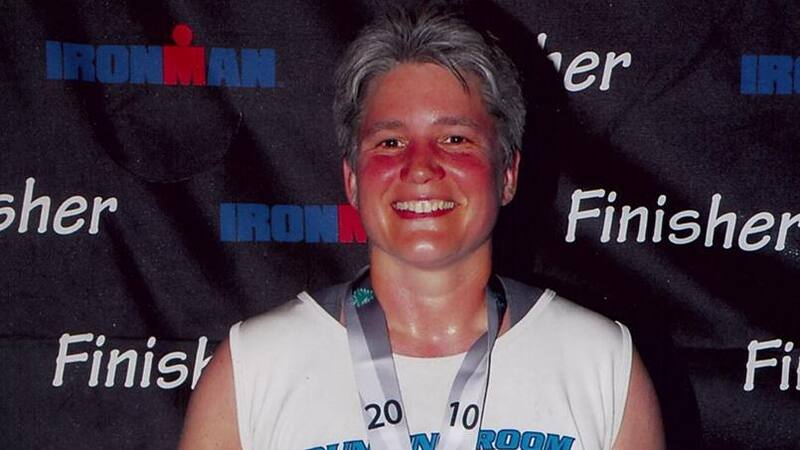 Inspired by Dr. Asp's athletic achievements and his cancer journey, Wendy registered for Ironman Wisconsin. Then she reached out to Dr. Asp's wife, Kathie, to ask permission to honor Dr. Asp by competing in his memory. She wanted to wear a bike jersey and running shirt featuring his image and raise funds for melanoma research in his name. "When Wendy told me what she wanted to do, I thought it was unbelievable," Kathie tells us. "She only met Dave once." But sometimes once is enough. "Wendy and Dr. Asp are people that enrich the lives of all they come in contact with," says Svetomir Markovic, M.D., Ph.D., Dr. Asp's doctor and Wendy's boss. Their lives and actions are reminders that "none of us are alone; we are all here for each other, to help each other," Dr. Markovic says. "Dr. Asp gave of his time to help us create a melanoma patient support group. Wendy gives of her time to acknowledge him and those like him who still struggle with this disease. The Mayo brothers would have been proud, I think." Make us proud by leaving a comment below before using the handy social media tools atop this page to share this story with others. Wendy what a wonderful honor and gift in Memory of Dave, to his family and all that knew him. I will be cheering you on from afar. Dave and I worked together in the Behavioral Health department in Red Wing for the past 19 years. He is missed and his spirit is still present with us all. Thank you for sharing your journey and for supporting a cause near and dear to him. My cousins live in Madison and I will encourage them to attend to cheer you on! Hi Wendy. Dave Asp was a longstanding and beloved member of the bike/ski/run group in Red Wing. Our group has countless fond memories of training and racing with Dave. He had an infectious enthusiasm for the sport and life that inspired us all. He was the founder and frequent participant in the “Wednesday Night Bike Ride” that took place in the beautiful bluff country of western Wisconsin throughout the summer. Dave was a fierce competitor and pushed us all to be better athletes. We miss him dearly. Thank you for honoring Dave during your event and we wish you the very best in your competition. You are welcome to join us on a Wednesday night ride. Dave attributed much his biking success to the challenge of the Wednesday night rides.